I’ve been very quiet recently because we’ve been away on a week’s holiday in Orkney. It was brilliant, despite me being a hormonal, shouty old bag. As usual, I took my paper journal to offload all the minxy goings-on, and I may or may not share them on this blog over the next week or so (though all the outdoorsy things will go on the Little Trekkers Ambassadors blog, as usual). I also have about 40 unpublished draft posts from the past month or so sat waiting to be finished… So, as usual, I’ll have to revert to dating each of my next few entries to make some kind of sense (!) to this. Anyway, despite all that, I really need to offload today. We’re onto Week 2 of the Easter Holidays, now, and The Boss is back at work, so I have the job of keeping the minxes from killing each other or me every day on my own. 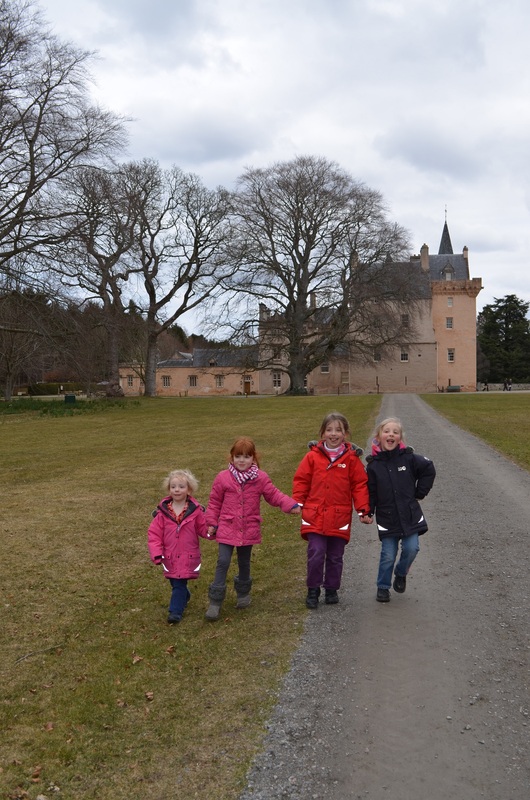 Yesterday’s trip to the beach totally failed to tire them out*, so today we met up with some friends and little Merida Minx at Brodie Castle, between Nairn and Forres. *They’re like dogs: if they don’t get enough exercise they fret (Maxi), get over-excited (Mini), don’t sleep well (all) and chew shoes (Midi). 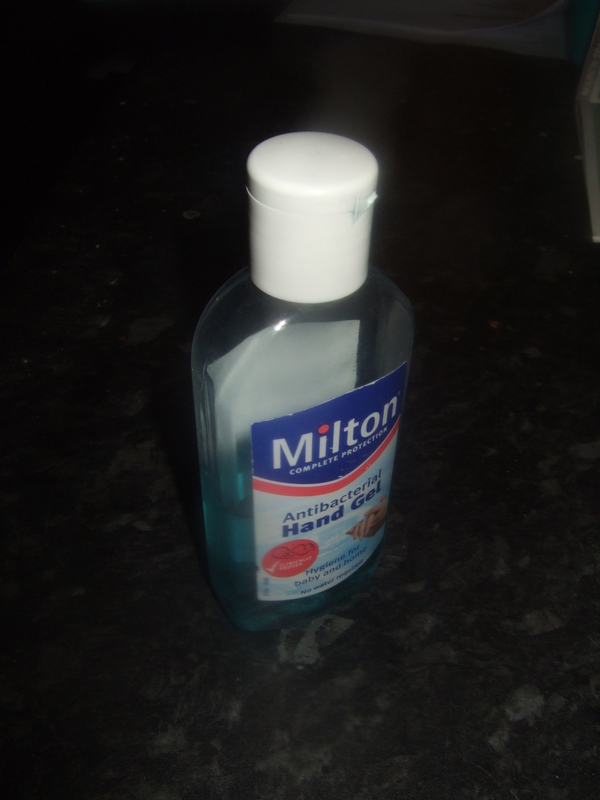 It has to be vigorous enough to “give me the sweats”, as Midi puts it so delicately. Bless. See? Sailing ship. Two Leaves. Twigs. They startled a huge Clydesdale Clopper out for a ride. The poor rider apologised to us after it had bucked and reared and kicked before she’d gotten it under control, yet it was our shrieking, flailing minxes who’d half-frightened the horse as it had drawn level and just forward of them – luckily for kids and horse that they were many, many metres apart the whole time. Then they headed straight for the Adventure Playground to wreak havoc there. I think by now you know I’m a helicopter mother: over-anxious, paranoid, smothering, controlling, wrap-them-up-in-cotton-wool, very risk-averse kind of parent. Every day I try so, so hard not to be, even though it physically wrenches my guts. I have a huge struggle with not being the clingy parent I am, and trying to be the hands-off parent I think I should be. Well, I’m sure I stunt their emotional growth with my shouty bad temper, so I really should make an effort not to stunt their ability to assess and take on risks and hazards. Predictably, Mini got to the top of the 3rd ladder, missed her handhold at the top, and fell backwards. She bounced off the first platform, then fell down the next ladder and collided with the next platform right on the top of her little bonce, and kind of twisted halfway out the wee open ‘window’. Well, I levitated up the first ladder before she’d even let out a scream (I think I managed a big loud “F***!”, though), and grabbed her up. My paranoid head was shouting inside about broken neck and spine injuries and not moving casualties until you know they’ve not broken anything, but the bigger Mummy Bear bit of my head just wanted to cradle my baby and kiss it all better. I know I probably sounded and looked very calm, but I just plonked down, halfway up the tower, and held her, rocking, for a few minutes. Partly to comfort her, partly because I was shaking too much to do anything else, and partly because I wasn’t sure that I’d managed to retain bladder control getting such a fright (I had. I stayed dry. Just in case you were wondering). After a bit, I dared to look and check that she was waving her hands about, kicking her feet, and seemed to have full control over her limbs as well as her lungs. When she’d calmed down a bit, I handed her down the ladder to Merida’s mummy. She instantly demanded to be let back up. No chance-eroony, little daughter! Baby playground for you! Where to be fair she demonstrated some nifty footwork on the rope bridges and happily scowled at all the boys in a 10 foot radius. Actually, the afternoon was a bit of a parenting fail. Maxi fell off the big round hammock swing, Midi fell off the aerial slide multiple times onto her (rock-hard) head, and then for an encore tumbled down the tube slide of that tower and out onto her bum. Although I made sure I could see the 3 of them at all times, and spent a bit of time hovering over each, I mostly stayed with Mini. But there’s only one of me and 3 of them. I’d never have gone to the playground had my friends not come too, and really lightened my load of both amusing and safeguarding the girls, but being typical children, they only fell when there wasn’t an adult immediately next to them. Now that a wee bit of time has passed since this afternoon, I can see some funny bits: I could see that Midi was falling off into the soft woodchips and bouncing up, laughing, and making comedy bows, so didn’t need me to come over fussing. And when she fell off the slide, she made quite a funny “bang… bang… bang-bang-bang… thump” noise as she clattered down. She related it breathlessly to her Daddy later as: “I did a double-cartwheel and went over and over and over!” Um…. not quite. But nice story. When Maxi fell, she also fell onto soft ground, and had a good, solid, whole-body-contact kind of fall. I went over to check she was ok and one of the kids on the swing with her farted. I mean, I know my bright orange hair is a bit scary, and I’m a bit haggard-looking nowadays, but honestly, I didn’t mean to frighten him that much! I quipped: “Wow, who just farted?” and the 4 of them bomb-burst to opposite ends of the playground. Oh, the power! Things did get better, though. In a bid to include The Boss in this week’s, um, ‘fun’, we picked him up from work at 5 then drove round to the swimming pool. I guess we picked the perfect time, because we 5 had the entire learner pool all to ourselves. Maxi and Midi threw themselves about boisterously in the water, and The Boss marvelled at Midi’s new-found water confidence, trying to swim under everything that she could. Mini was typically slow to get her water feet. But when the aqua aerobics class started, she had me in stitches as she danced along in delight. She bounced and twisted her little hips, chanting: “Wiggle-wiggle! Wiggle-wiggle! I wiggle my little fat bum-bum, Mummy!” After a bit, she got too tired to remember to stand back up again when she fell over in the water. And she forgot that she’s scared to go down the little slides into the pool and got almost as noisily splashy as her sisters. I think I laughed non-stop for half an hour at their antics. Looking at 3 tired little minxes who’d never last the journey home, I twisted The Boss’s arm, and off we went to Evil McDs, where I got to scare a whole restaurant full of people with my frizzy, half-wet, orange fright wig. Extra bonus points! Well, what do you know? The weather forecast changed, and so did our plans. A quick shifty of where it was raining or sleeting, where the best visibility was, when it would clear and warm up (oh ok, become a bit less cold) and which day it would bucket down left us deciding to get out in the fresh air today. 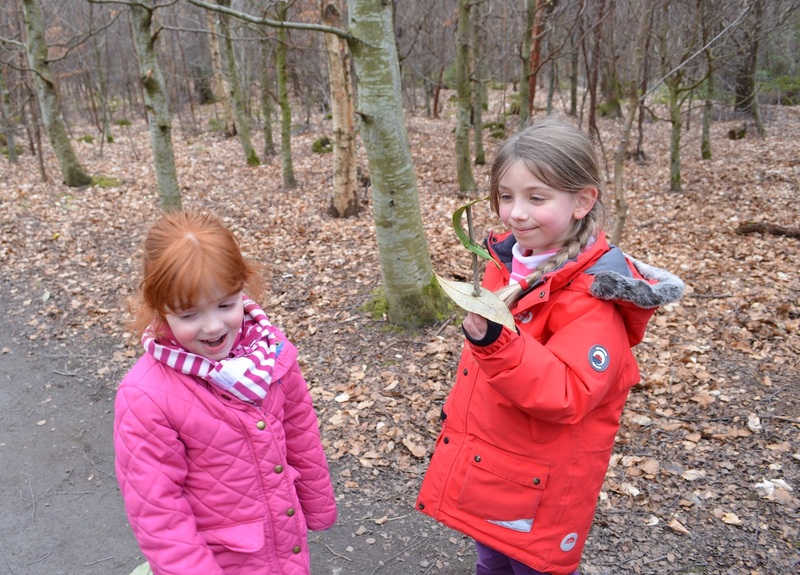 So… Aden Country Park near Mintlaw it was! I gave up loading the car with bags and just put everything in 2 big laundry crates. Well, have you seen how much space 5 pairs of wellies take up? The Boss has very big feet. And then there’s 5 sets of waterproofs and fleeces, 5 complete changes of clothes, 5 snacks, 5 drinks, etc. We stopped in Banff for lunch. No fancy treat lunch today – The Boss did a brilliant run and grab at The Co-op and we ate our quick, healthy, cheap-ish picnic lunch in a little car park on the East side of the bridge over the river. The Macduff side of the bridge, still on the A98. Right here. And watched the mental waves. Don’t watch them drunk – they come at the shore from literally all directions! I uploaded a 17 second video clip, because still photography doesn’t do it justice. Eventually we came to the country park, got changed into (freezing) cold weather gear in the car park and discovered our visit would be free as the machine was on the blink. It would have hardly broken the bank though – 70p for 4 hrs parking, £1.50 for all day. So, ready for the cold, we went to explore! The kids’ playground was really good. 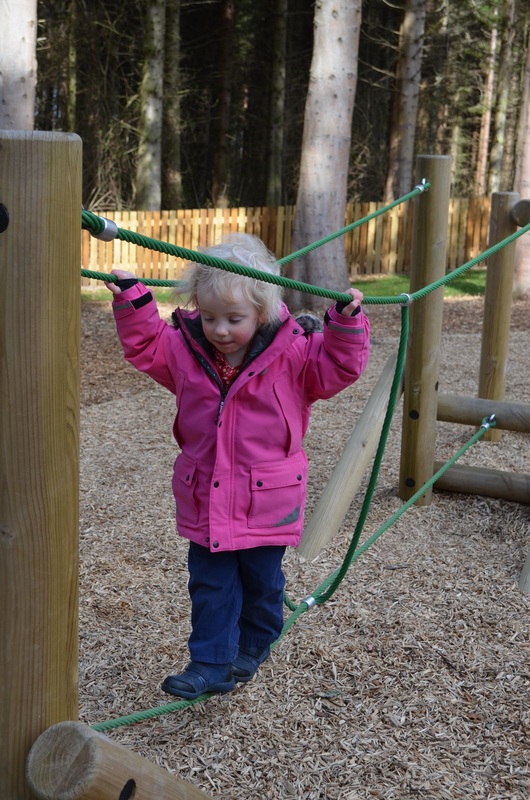 Only a couple of swings, but plenty seesaws, a slide, clambering tube, zip line, whirly roundabout and a great wee ‘outdoor gym’ trail – things like stepping poles, balance poles, wobbly bridge, tyre chains. The minxes loved it! We had to prize them away to go and find coffee / milkshakes. Me and The Boss loaded up on heat and caffeine while the girls guzzled ice-cream, milk, squirty cream and marshmallows. After a snack like that, you have to let them run around. So we went off exploring the arboretum. Over the next 3 hours we played Pooh Sticks (except for Mini, who prefers Pooh Stones. And is eternally exasperated at never winning…), swapped round which daughter was in the wrap, wiggled through the beautiful Sensory Garden, wandered round the all-abilities buggy-run, up the tracks and over the dog exercise area (clean! It was clean! Some really, really responsible dog owners! Thank you! ), around the duck pond, past the mineral well, up the tree house and then the best bit for Maxi and Midi: clambering all over the enormous fallen tree that they honed their bouldering skills on. We were really sorry to leave, especially when the spring sunshine finally blasted through the chilly air. But dinner called. And The Boss was feeling flush. So a quick stop and clean up at the absolutely spotless toilets and off we went, past the fields of wobbly new lambs (I’d seen one sheep in the middle of giving birth as we drove past that morning). We stopped at the Gold ‘n’ Crispy in New Pitsligo. It was busy at 1730hrs on a Wednesday, so that bode well. We all ate in and shared 3 big fish suppers. Yum! Crispy and delicious. I guess we could have zoomed home afterwards, but it was far nicer to bimble along the coastal trail, even though it was straight into the sun. The funniest bit of the day was little Mini desperately trying to stay awake to eat her treat of a chocolate chip cookie. She fell asleep clinging to it. When she was wakened 15 minutes later, she started biting at it before she’d even opened her eyes. Before I go, I have to give a quick mention for Deeside Holiday Park – I phoned to cancel our camping booking with them, explaining that although me and The Boss were happy camping on snow, our little girls weren’t yet accustomed to extreme weather. I cheekily asked if I could shift my booking a few months to the summer, when The Boss would next have time off work, and not lose my deposit. The witty and funny Shona did exactly that, even though the Ts&Cs say that you can’t. What a lovely lady – I can’t wait to go! Yesterday was quite a day for my baby Maxi Minx. She’d been up chattering and giggling with me as she crafted with pens and scissors as usual (she likes to make collages using shapes and their negative spaces(!)) and I cooed over a newly-arrived parcel of wool. As I was stroking the fibre, she asked shyly if I wanted to see the holes in her pyjamas. I didn’t shout. I didn’t scream. I just explained how sad I felt because they’d cost a lot of money, she’d worn them twice and now were ruined forever; she’d never be able to wear them again and Midi and Mini would never get to wear them at all. I thanked her for saying sorry (she went quite hysterical) and fairly successfully stayed calm. Well, I could see that my crappy sewing skills weren’t going to resurrect them, so what else could I do? Besides, my little Chicken-Licken* brain was whirling over the fact that if her ‘child’ scissors could cut through a double layer of material that easily, they could have made a mess of her 5 year old baby skin just as easily. (Guess what’s been confiscated?) Also, she was utterly distraught at me banning her from any form of crafting for the rest of the day. *Chicken-Licken: fairytale about the chicken who feels an acorn fall on his bonce and assumes the sky is falling down; goes into a total flap about something innocuous. That’s generally me, that is. In a bid to not stay in the house all day, and seeing that the weather forecast was wrong (hooray! ), I sent the kids out to race round the garden. Wee Mini happily staggered around in her lovely purple Tevas strapped over her babygrow – no point dressing her up for a stay at home day. All 3 girls played at basketball (chuck the little ball through a hula hoop held by a sister, and try hard not to chuck said ball at sister’s face…). On a whim, I put Mini in a waterproof all-in-one and put long sleeves and leggings on Maxi and Midi and headed off to the local woods at the bottom of the street. Now, recently we’ve have little home-made cards posted through the letterbox warning us of Lyme disease in the ticks in the local area. I had Lyme disease back in 2005, caught whilst climbing at Fontainebleau outside Paris, and although I got completely well 2 months later, I really struggled to get sufficient treatment. As a result, I wrote a few articles, such as this one, and have a bit of a horror of the ugly things. My kids routinely wear long sleeves and trousers when out and about and are taught not to go wading through the bracken. Me and The Boss also routinely do tick checks of ourselves and the girls if we’ve been out in typically tick-y areas. But we don’t stress about it, don’t indoctrinate the kids and indeed this year have pulled one off the front of my armpit, one from Midi’s armpit, a few from The Boss, and found a few big buggers in the house (thanks to the cat). Oh, and one crawling over Maxi’s clothes last week in the car. She’d been moaning that she was the only one in the family who’d never been bitten. Anyway, Maxi noticed new signs put up at the entrance to the wood to match the posted ones about Lyme disease and asked what they were. 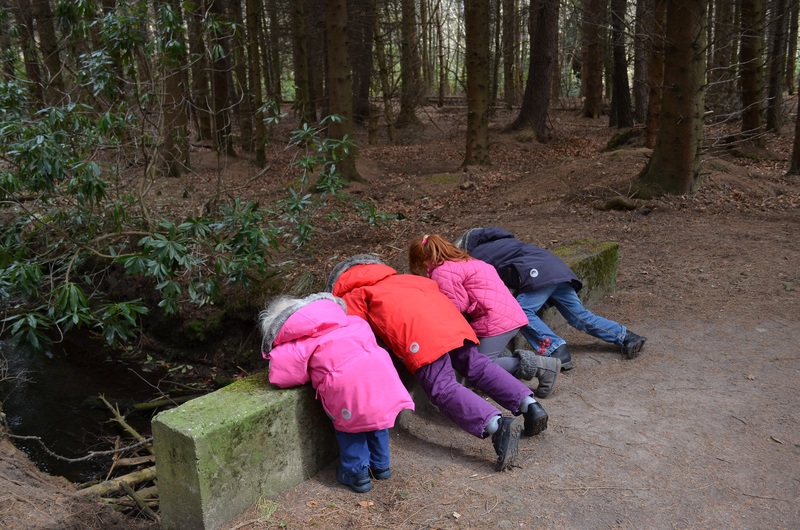 I explained a little about Lyme disease, really down-played it, and explained that I made them wear leggings and fleeces to help stop so many ticks getting to us. I mean, who wants to be an insect’s lunch? She chatted away, skipping around, plucking dandelion clocks and chasing speckled wood butterflies. Mini snoozed in the sling on my back, and Midi held my hand tightly saying how tired she was (till I suggested we hit the swings instead…). Actually the swings were a hoot – Maxi and Midi both tried the long zip wire solo, holding the seat tight with their little hands, knees held aloft, zooming down the bark landing field, scraping it into their shoes and pants. Midi only tried it after seeing her big sister zip along so fast. I applauded each effort, and couldn’t help laughing – they looked so exhilerated! Midi seriously impressed me by only falling off once, when the seat boinked off the end of the ride, the first time only. Well, at the end of what turned out to be a very nice day after a dodgy start, The Boss was getting the girls into their bath. And Maxi had the biggest tick I have ever seen stuck neck-deep in her precious skin, in the fleshy bit in front of her armpit (where my last one was). Yuck! I can’t convey the sense of dread and disgust I felt. I’m not sure how successfully I covered it up and explained as nonchalently as I could to Maxi that Daddy was going to hook it out with a special hook, we’d put Germolene on it, and watch for any rash coming up for a few weeks, but it was no big deal (she has a real tendency to Chicken-Licken hysteria. Like me). I resisted the temptation to go off the deep-end and race her to A&E (yeah, yeah, yeah, I know/knew a lot about Lyme, but this is my baby girl we’re talking about, here!). So I spent the evening Googling about Lyme prophylaxis treatment in children and getting my old knowledge up to date (like, when did they rename ehrlichiosis?!). I’m now very happy (!) to just observe her for a few weeks, and if she does develop Lyme symptoms (or HGA), then I know the most credible and recent articles to quote when I request specific treatment for her. Funnily enough, over dinner I was telling The Boss that if I had more time, I’d like to add my own sign under the Lyme warning ones adorning the woods, saying “Lyme won’t blind your children – leaving your dog’s poo on the path might. Get rid of the mess!” That path was downright disgusting. 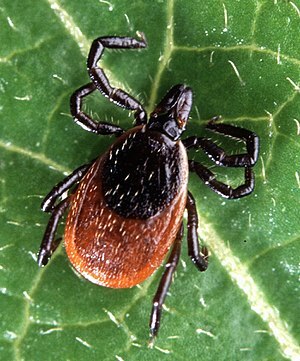 I hate lazy dog-owners more than I hate ticks! In the words of Baby Bud, “Aaaaaah’ve had a fabby dayyyyyy!” Well, I was on a roll after braving the beach with the 3 minxes on my own on Tuesday, so today I upgraded in difficulty: 3 hours on the same beach with 3 minxes, not such great weather, another little girl and her mummy. Roll the pastry into 6 shapes roughly circle-ish. Mix the lamb and mashed sweet potato together, then dollop it onto the circles. Brush the edges with milk, then join (do whatever shaping takes your fancy). Brush with more milk and stab in the side to let the steam out. Bake at 220degC for 20 mins then 180degC for 35 mins. 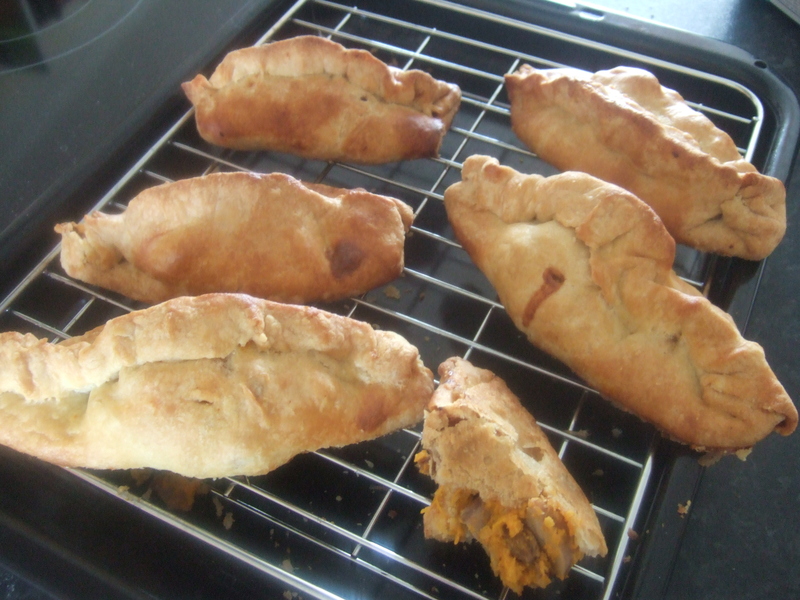 They went down a treat, but would be even better with chopped onion and gravy, I think. What a shame, I’ll just need to try that recipe out this weekend, then…! I digress. So, I loaded the car boot with pasties, boiled eggs (decorated again by minxes, which kept them occupied for 15 mins while I got stuff together), cake, apples, juice cartons, cheese sticks, pepper fingers, big flask of coffee for me (it was a rough night…) and a ton of spare clothes, and off we went for an 1130hrs rendezvous. We had a hoot! 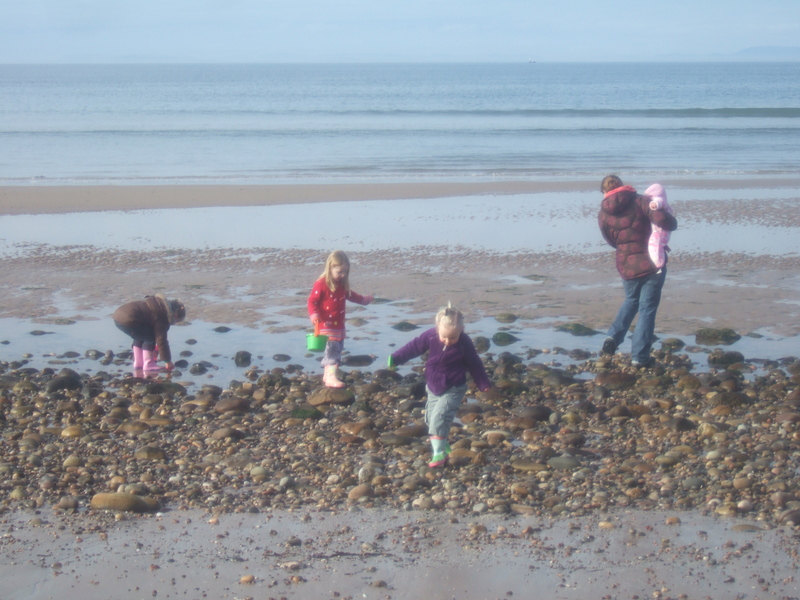 Loads of beach-combing (I spotted oyster shells larger than my palm – I was more excited than the kids! ), being flown over rather low by a Hercules, bubble-blowing (I’m proud of that – I brought a bottle of bubbles along as a distraction tactic for when I needed the kids to stay in one place while I did Mummy-guff), lunch-munching and general puddle splashing. Why the praise for the bottle of antibac in the top picture, though? Well, the minxes were true to form and all 3 poo-ed within the space of 10 minutes: one in a nappy, one in a portaloo (it nearly blocked the chemical toilet – I did a muscle in pumping the flush) and one in a hastily dug latrine. With a toy spade. Being a complete dog poo Nazi, you can imagine how deep I dug that hole and how well I filled in and stamped on it. The 3 eldest girls had lots more fun at the playground while the youngest one yelled and squealed at them (through the goo of her eye infections – they had gotten so much better so I’d not gone to the docs, but today was a set-back. If no better tomorrow, I’ll battle the vaguaries of the appointment system and get her checked out, even though she seems ok herself). To top off their day, it was a ballet day, so I plonked the minxes in the car and drove half the beach to the class. 4 wet wipes and a hair brush and they almost looked human (ballerina-like they were not). Was today a success, then? I have a wind-burn glow, Midi Minx was so worn out she fell asleep in her dinner and Maxi Minx declared it ‘My Best Day Ever. Ever. Really’ before wolfing her pasta bolognaise as fast as her sisters. I’m very proud: eat well, play well, sleep well – just what I want for my growing kids. And dealing with their synchro-poos without disaster (yet) has made me confident enough to start properly resuming my former outdoor life, so time to venture further afield next week – yippee! !